Anarres Infoshop & Community Space, 7101 N Lombard St.
An engrossing century-spanning narrative, Tear Gas (which came out in November,) is the first history of this weapon, and takes us from military labs and chemical weapons expos to union assemblies and protest camps, drawing on declassified reports and witness testimonies to show how policing with poison came to be. Anna Feigenbaum is co-author of the book Protest Camps, and her work has appeared in Vice, The Atlantic, Al Jazeera America, The Guardian, Salon, Financial Times, Open Democracy, New Internationalist, and Waging Nonviolence. She is a Senior Lecturer in the Faculty of Media and Communication at Bournemouth University. Her website is www.annafeigenbaum.com. 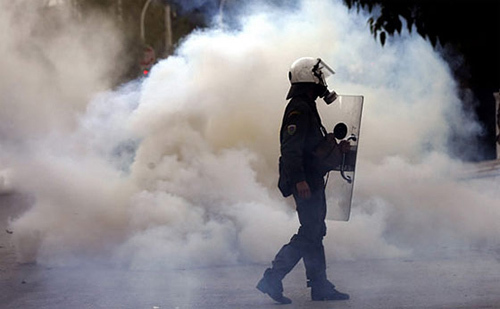 Anna speaks both on the history of how tear gas has become the most common “less-lethal” weapon used by police, and can also conduct a workshop on how to identify, monitor and report different types of chemical weapons, as part of the RiotID project that she is involved with. *note on accessibility: the space is wheelchair accessible. The door to the bathroom is about 25.5 inches wide taking into account the door frame. We recognize that this is not accessible for all wheelchair sizes.